Goal-setting is often the key to success and productivity but sometimes it’s hard to tell when goals are realistic and reachable, both for a company and individuals. Setting goals and objectives that are unrealistic, too vague, or for teams that are unable to work together is a waste of time and can actually hurt morale. Want to figure out how to set goals that are reachable and reasonable? Make them SMART. In this case SMART doesn’t just refer to intelligence. 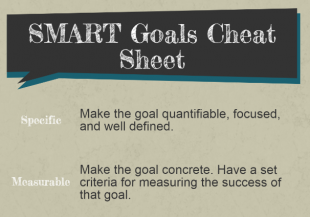 SMART goals are specific, measurable, attainable, realistic, and timely. This kind of goal setting is especially useful when working with Gen Y employees who have grown up surrounded by this approach in schools and universities. Setting goals in a style that is in line with their learning gives them specificity and constraints to work in. Specific – The difference between “we want to improve website traffic” and “we want web traffic to go up by 15% this quarter”. Measurable – The difference between “we want improvement” and “we want to see a 15% increase”. Attainable – The difference between “we want to triple our income this quarter” and “we want to see a reasonable increase in income”. Realistic – The difference between having a lot of goals you don’t have enough resources to reach and having fewer, but reachable, goals. Timely- The difference between “we want to see a 15% traffic increase in the near future” and “we want to see a 15% traffic increase this quarter”. Feel free to print and use our SMART graphic as a reminder to stay focused when meeting with your team to set goals. No matter the department: management, sales, marketing, development, or company-wide, you need to be prepared to set goals to stay organized and motivated. If you actually want to reach those goals make them SMART. Want to improve your goal-setting? Check out OpenSesame’s full selection of goal-setting courses.